Trucks In 2018 Look Horrifying. How Did That Happen? Whether you realize it or not, the fact is that at this very moment, in the year of Our Great Sky-Trucker 2018, there is something powerful and sinister happening in the world of truck grille design. Truck grilles are growing at alarming rates, and becoming more and more intricate, Baroque, and confrontational. The new 2020 Chevrolet Silverado HD is the worst offender yet, but it’s far from alone. 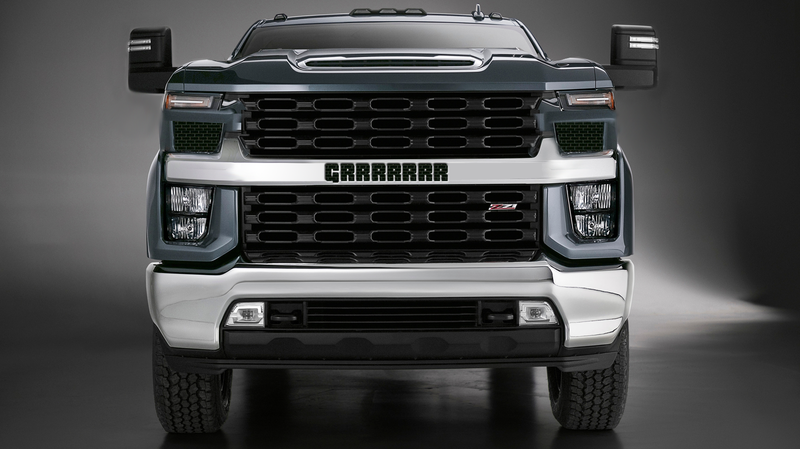 First, though, I want to be clear that I do understand that trucks do need relatively big grilles. Large truck engines are tasked to do difficult things, not the least of which is the dreaded SAE J2807 test: a 100 degree Fahrenheit full-laden slog up the steep grade of the Colorado River’s Davis Dam while pulling a trailer and with the AC on full blast. To get through something like this without overheating, most trucks do need a good amount of airflow through the radiator, and the way to get that sweet sweet air in is with a good-sized grille. We can trace this trend back to Dodge in the mid 1990s. Truck design had become a bit rote and boring, and Dodge was in the process of re-designing their Ram trucks. In an inspired move, Dodge designers took inspiration from big rig 18-wheeler trucks, creating a front end design that looked purposeful, powerful, and confident. The front end was more sculptural, with a central bulging hood and lower fenders flanking it, capped with a large, bold grille front and center. It looked muscular and athletic and people loved it. This sparked the current trend of front-end truck design that emphasizes size and strength primarily, though things have changed and evolved significantly since then. The three-form front design of the Ram is not part of the other major truck makers design vocabulary generally, with major players like Ford and GM using a massive, monolithic one-block design for the front. What they all have in common are colossal grilles that dominate the front ends of all their trucks, and have recently become more and more ornate and complicated and overdone masses of holes and thick slabs of chrome. Ford likes giant belt-buckle-like expanses of chromed plastic, with fussy tight mesh-work and massive central bars that push the grille into the headlight’s territory, like a massive tumor taking over a face. Most of these trucks are six feet tall or more, which means that the hood height is around four to five feet off the ground, which means that if one of these is behind you, you’re greeted with the sight of just grille, massive and hungry, filling your view. I like pickup trucks. I like vehicles that have a job to do and are capable of doing it. I even owned a lifted pickup, once. But I’ve never felt the urge to drive something that looks like, were it to be given life by a mischievous, visiting wizard, would be shaking with constant rage and could only communicate via tortured, blood-curdling screams. Well, at least our coolant will keep cool, even if we’re no longer capable.